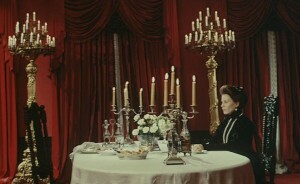 Alongside nominations in four other categories, Cries and Whispers won the Academy Award for Cinematography for long-standing Bergman collaborator Sven Nykvist, who won again a decade later for Fanny and Alexander. 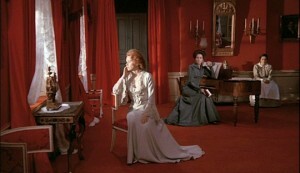 Both films were shot in opulent colour, making particular use of brilliant whites and intense hues of red, but while the later, livelier film is animated by pattern and activity, the former is characterised by areas of solid block colour which appear all the more oppressive set against the anguished expressions of the film’s protagonists. Credited with pushing Bergman’s films into more cinematic – rather than theatrical –territory, Nykvist is often rated as one of the very best in his field.